Trautwein GmbH | Changing table Aluto | Changing table Aluto. BATH AND NURSING APPLIANCES » Changing table Aluto » Changing table Aluto. 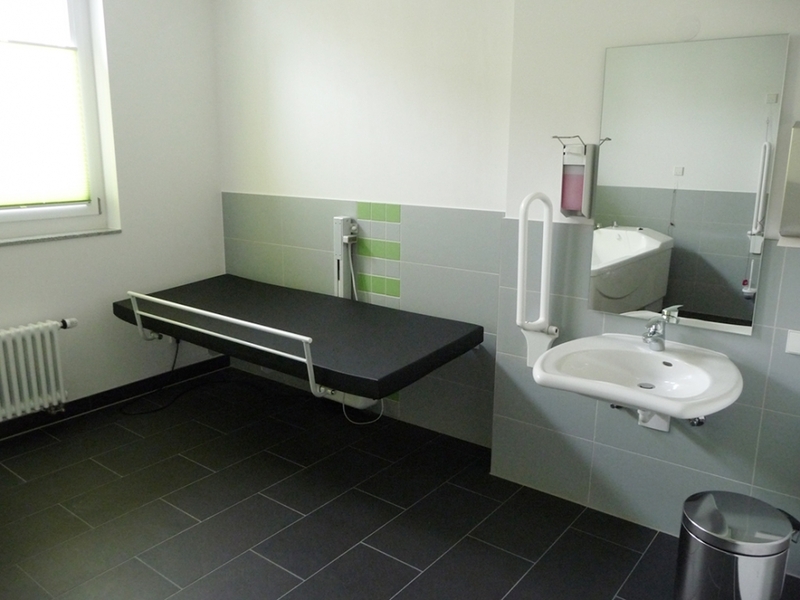 The Aluto changing table allows to treat patients easily and gently. Its construction - a result of the long time experience of professional therapists - permits to work in a back-friendly way. Numerous further details facilitate the treatment of persons in need of care. Stageless lifting system with electro-mechanical height-adjustment from 510 up to 960 mm. Mobile air drive controller allowing the staff to stay close to the patient. Lying area 1900 x 800 mm, thickness of upholstering 50 mm with cover of skin-friendly material. Water and oil proof surface for optimal hygiene. Long front side with tiltable railing; automatic lock-system in upper position. Supply voltage 230 V with integrated GFCI (30mA) in the plug. With insulation transformer 230/24 V.
Option to install 1 or 2 collecting trays on the extensible rails. Broschure "Bath and nursing appliances". Text for invitation to tender and technical details "Aluto".